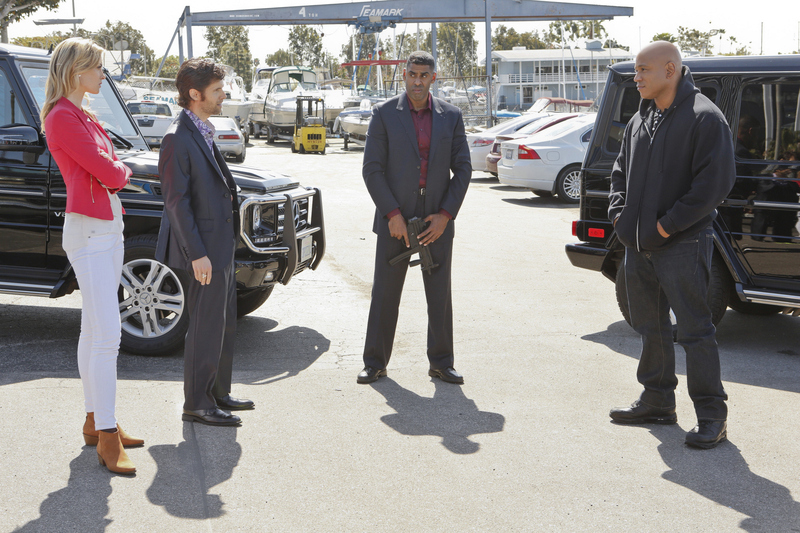 Pictured: Emily Baldoni (Olivia Brunson), Stephen Wozniak (Tyler Brunson), J. Teddy Garces (Guard #1) and LL COOL J (Special Agent Sam Hanna). When an undercover NCIS agent is suspected of working for the smuggler he’s supposed to be investigating, the team takes him into custody to find his true intentions. Meanwhile, Kensi and Deeks discuss their personal relationship as Kensi returns to the field, on NCIS: LOS ANGELES, Tuesday, April 15 (9:00-10:01 PM, ET/PT) on the CBS Television Network. Daniel Henney guest stars as Paul Angelo, the undercover NCIS agent. Photo: Cliff Lipson/CBS ©2014 CBS Broadcasting, Inc. All Rights Reserved.